I was interviewed for the March edition of The Chronical of Skin & Allergy about a new study showing that women with central centrifugal cicatricial alopecia (CCCA) are at increased risk of developing benign uterine tumors known as fibroids (uterine leiomyomas). The study was published in JAMA Dermatology. CCCA is one of the cicatricial (scarring) alopecias that occurs predominantly in women with afro-textured hairs. This new data suggests that a genetic predisposition to develop excessive scar tissue in other area of the body may be fundamental to the underlying mechanisms that cause these two diseases. The study researchers reviewed data from nearly 500,000 black women in the general population and examined the incidence of fibroids in women with CCCA and those without CCCA. In the general population, 3.3 % of women had fibroids. However, among women with CCCA 13.9 % were found to have fibroids. Taken together, this works out to a five fold increased risk of fibroids in women with CCCA. 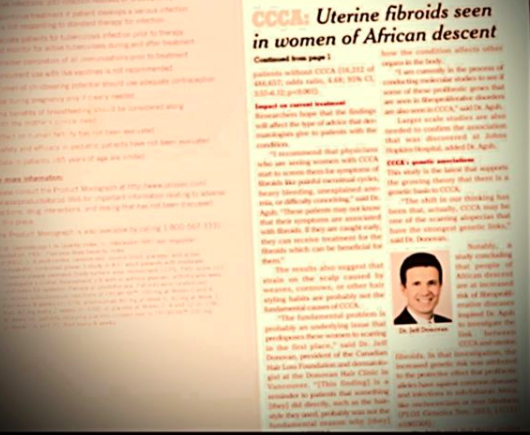 There is an increased risk of uterine fibroids in women with CCCA. Whether there is an increased risk of other scarring related diseases of the body warrants further study. Dina et al. Association of Uterine Leiomyomas With Central Centrifugal Cicatricial Alopecia. JAMA Dermatology 2018; 154; 213-214.